Climate of Mauritius. . . Tropical and mostly temperate throughout the year, the climate of Mauritius is influenced by the interactions of oceanic and atmospheric components. Winds known as South East Trade Winds and blowing from subtropical high pressure zone, tropical storms, air masses, sea and land breezes all alternately combine to give the seasons in Mauritius their respective hues and shades. Sea breeze is a local wind blowing from the sea to the land on a hot sunny day whilst the lighter land breeze circulates in the reverse direction at night when the land becomes cooler than the sea. Winter weather in Mauritius is dominated by anticyclones - areas of high pressure in the southern hemisphere and around which winds blow in a counter clockwise direction . Anticyclones move eastwards towards the equator and bring cold air over the Mascarene region. When the leading edge of a cold air mass, known as a cold front, moves towards warmer air and crosses over Mauritius the weather is mostly showery with strong chilly winds blowing from the southeast. Significant temperature drops can be sudden. Trades winds are very strong and gusts reaching more than 60 kilometers per hour are often recorded. 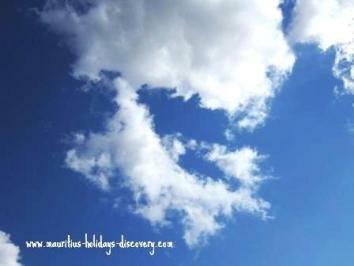 When the weather is free from anticyclones, Mauritius enjoys a mild temperature with clear skies. Besides tropical depressions and cyclones, the climate of Mauritius in summer is influenced by strong insolation, light winds and moist and unstable air masses which favor the development of clouds. At times violent thunderstorms accompanied by heavy downpours occur. Rainfall is also abundant during summertime when the Inter Tropical Convergence Zone, ITCZ, an area near the equator where winds from both hemispheres meet, approaches Mauritius. The ITCZ favors the formation of cumulonimbus clouds which have high vertical extent reaching up to 12 kilometers. Thunderstorms accompany the cumulonimbus clouds and are characterized by heavy rains, gusty winds and sometimes hail. Huge lightnings sparks or thunderbolts are visible and within seconds a trillion decibels crash of thunder tears the sky. Thunderstorms occur mostly during December through April. 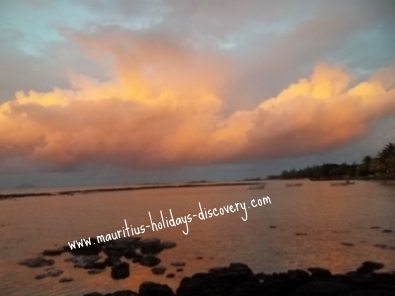 Mauritius Island covers an area of 1865 square kilometers and is located near the edge of the southern tropical belt. 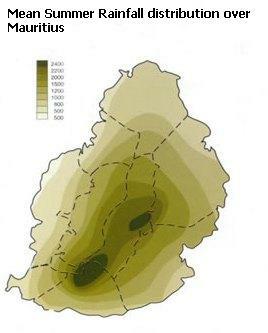 The climatology of the island is not influenced by large continental land masses and varies little. But to better understand the weather, Mauritius is divided in 5 regions. Pamplemousses (north), Medine (west), Fuel (east), Plaisance (south) and Vacoas (center) are considered to be representative of the five regions.